Dustin Werbeski makes the impossible seem simple. If you’ve seen any of Dustin’s video sections, you’ll know he constantly pushes the boundaries of aggressive street skating, big wheel blading, and mountain blading. And while his skating began quite humbly a generation ago in Regina, Canada, his adventures have taken him all the way over to Barcelona, Spain–where’s he’s been living the blader-dream for the last few years. My setup(s) are always changing, as I am always testing new sample products, but I do have preferences. For aggressive blading, I will always prefer Xsjados, but for my off-roading and freeskating, I really like the Powerslide Tau skate. It is a solid carbon boot, with no pressure points and the best support I have ever had in a rollerblade. The trinity mount is amazing for precision control and the added comfort, of not having a bolt right under the sole of your foot. This was the first skate that I received from Powerslide, where I was truly blown away by the quality. 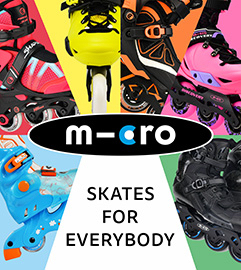 It is great that there are still companies in rollerblading that have the ability to test and use the highest quality materials. What age were you when you got your first skates? Do you remember what they were? What made you want to get into rollerblading? I was about ten years old when I first convinced my parents to buy me a pair of skates, along with a couple of magazines. The skates were a “Wal-Mart-like” pair of “Cheetah’s”, which were made from plastic and were olive green with gold highlights. Seeing blading on TV really formed my interest in it, but the main reason I got into skating was thanks to my best friend Devon. He is actually my younger uncle, so I have lived my life with him like a brother. He was into skateboarding in the 90’s and figured I should be into something similar, but he did not want me skateboarding because “he did that”. So, I guess I just picked blading not really knowing why. It was not too many years later that I convinced him to switch and start blading with me. We spent our remaining teenage years travelling and filming together. I really have to thank him for that innocent childhood tip that completely changed my adult life. What brought you to Barcelona and kept you there for so many years? Just as it was a friend who got me into skating, the same thing could be said about Spain… I did end up growing up and skating with the infamous Richie Eisler, until we both moved away from Regina. Magically we both found ourselves back home one summer just in time to be invited to Spain for the Fall. Together we planned everything that would be needed to be done for a year-long project there. The next thing I know, I was in Barcelona shooting photos of the people I once idolized. After the year was over, I was offered a professional blading position on the Xsjado team. This kept me there living the pro blading dream for a handful of years. If I did not promise myself, that at 30, I would focus on my photograph, then I would most likely still be in Spain, struggling to survive off of a small income from this sport. Were you both big wheel blading and aggressive skating the whole time you lived in Barcelona? Big wheel blading came to me on the first day in Barcelona. Oli Benet had several pairs of big wheel skates in his collection of Powerslide products. We tried some out and ended up ordering all the fitness frames, 80mm wheels and grind pins we could get. It took a while before we fully realized their potential, but it didn’t take long before I gave up on my freestyle grinding frames. The daily switch from eight 80’s to four 58’s was brutal, so this really got me addicted to big wheel blading around town. I was officially a big wheel blader once I learned that you could do all the same tricks, plus a lot more that were not even possible on small wheels. Do you prefer freeskates with 110mm or 125mm wheels? Is there a big difference? If so what are the pros and cons of each. I really do prefer the 110’s over the 125’s… 110mm are the perfect size; it gives you the speed of big wheels with the control of small wheels. I also don’t like being too tall on my skates, so again the 110’s are better for that. If there is a benefit to the 125’s, it is the little extra speed and the ability to lay your boot further down when powersliding, before you hit plastic and slip out. But overall, I will always choose 110’s for their control on small streets, and their ability to be used for “stunting” without feeling like you are going to break an ankle. How about for off-road skating? Do you prefer a 125mm or a 150mm setup? What are the major difference, advantage and disadvantage of the two sizes? For off-road skates, I have always preferred the 125mm wheels. I just find the 150mm skates too heavy, tall and long. Where as the 125’s feel a lot closer to the big wheel blading we do on the streets. The 150’s do have benefits when it comes to riding on loose gravel, as they will roll over and through more then the 125’s will. But, if and when you find the perfectly groomed trail, the 125’s exceed the abilities of the 150’s. Just like the debate over 110/125, I prefer the smaller ones for the feeling of control, and the ability to stop whenever needed. Off-roading without brakes really requires confidence and control in your skates. Skiing drop in with a powerslide to control speed. How is the mountain and off-road terrain in your part of Canada? I live in the middle of the prairies, it’s so damn flat. But luckily I do live near a beautiful valley with lakes surrounded by some decent sized hills to skate on. It is far from ideal though. I am currently trying to shoot a SUV edit at the now closed for the summer ski resort right near me. That is probably the best place for me to be off-roading until I head to the mountains next month. How hard is it to actually start off-road skating? Starting is easy; it is stopping that’s the hard part! Actually, the hardest part is finding a spot that is safe and easy to begin on. I would highly recommend a big open grass hill or a very hard packed dirt trail. The grass hill will teach you to carve like you are skiing, and the trail will teach you the feeling of striding on the taller and longer frames. I would recommend learning with a helmet, as I have taken and seen some pretty terrible falls on them. What is the craziest hill you have bombed? There were too many epic hill bombs in Barcelona to name the craziest one. But a hill I can recall as being terrifying was Marc Moreno’s hill. If you ever go to his house, walk up way past it, around all the S-turns, past the “rumble strip road”, all the way to the top where it ends at stairs and rails and banks. Drop in on the first bank and bomb the whole hill back to the metro stop at the bottom. The speed was insane, and the fact that I did it in shorts and anti rockers still blows my mind. I was not planning on it being so intense, but I could not pass up on the rush. It is a similar story the night I skitched a taxi from downtown Barcelona, onto the freeway to France, and let go once I got out of Barcelona near my home in Torre Baro. Skitching isn’t really a hill bomb, but it was one of the craziest things I have ever done on skates. Have you had any close calls, almost been hit by vehicles or had injuries big wheel blading? Honestly, I have no idea how I survived Spain, every day there was at least one close call. That’s what happens when you skate on busy roads and sidewalks, all day, at full speed, you weave your way through dangerous situations non-stop. Sometimes the lines I would choose were just stupid, but luckily they always worked out. I am grateful I never injured a pedestrian. Also I would feel bad about some of the old people or children that I scared as I flew past. Big wheel blading has saved my own body from many more injuries. I get hurt a lot less on them compared to grinding and doing gaps on “small wheels”. Mono roll up and back down. What’s your favorite thing about big wheel blading? My favorite thing about big wheel is the ability to have as much fun as I did when I was young. It feels like learning a whole new sport, but with the learning curve being so much smoother, as I already knew the basics. Learning to grind on big wheels was a challenge that I loved taking on, but it is not something I am focusing on… I believe there is a whole new bag of tricks waiting to be learnt and applied to big wheel blading. Another thing I love about big wheels is learning how to use them in ways that they were not intended to be used. How does riding on big wheel skates compare to skating aggressive skates? When just riding around, nothing compares to big wheels… However, my new Undercover 59mm pro wheels have a super pointy profile and compare to the feeling of freeskating on big wheels. That profile allows for that whole swivel, pivoting control you get from the pointy wheels. I love just bending my ankles and having my feet lead the way! How often are you skating now that you live in Regina? Now days it is only about once a week. It is sad, but I am the only skater in Regina, and I have a full-time photo job. I am filming a Xsjado farewell ad right now, so I will be spending more days then usual “vandalizing” this cities architecture. It feels like my body wanted me to stop being so aggressive first, and now my mind is catching up. I live with my little brother, who still has his ancient Xsjados, but he has only skated with me once since I have been back home. Mostly it is just my wife and I making a quick stop while we are in the city running errands. We will be out shopping and I see a spot, I will stop, strap up, do it, get her out of the car, compose the shot, and get her to shoot me doing it again, then skates off and back to normal life. It is quite weird slipping in and out of my skates and that mentality every few days, instead of every few hours like it used to be when I was surrounded by my skating friends. Soul to soul on the air vents. I believe you are the first skater to get a pro big wheel? (As well as aggressive pro wheels) How does that feel? Have you had feedback or people contacting you about getting your wheels? Wow, that’s a dope thought. It is a honor to think about it in such a way. It feels amazing to receive messages from homies who are happy to be riding my wheels, and feel the need to show me. Thank you all for such! I have to thank the guy who got a whole set of my “moon” wheels tattooed on his arm, that’s the most positive feedback I’ve ever received! You had a pro aggressive skate from Xsjado. Do you think Powerslide will ever release a pro big wheel skate in the future? For me? Nope! There are some behind the scenes issues preventing Powerslide from ever giving me another pro skate. I am thankful for what I got, and will be grateful for whatever I get, from whomever it may be in the future. Though I won’t be holding my breathe for a new pro skate, that’s for sure! What are you doing in Regina? How is your photography going? I always promised myself that at thirty, I would focus less on blading, and more on my photography, wherever in the world I may be at the time. It just ended up that moving back home timed out with that plan perfectly. If I stayed in Spain, it would have been too easy to stay in the starving artist cycle that I was in. I was not saving up anything, and barely developing myself outside the skating world. But now, being back on this side of the globe, I have the best photography job ever. I work at Film Rescue International and love spending my time in the darkroom, developing lost and found, super expired rolls of film. In the hundreds of rolls I go through a month, I get to see great images from all over the world, and from all periods of time. While doing this, I also get to spend as much time as I like working on my own photo projects, which have been long overdue and abandoned because of my blading. Basically, I am super happy with how my lives as professional rollerblader and photographer evolved together, and where I find myself with them now. Where do you want to see your photography go in the future? I dream of seeing all the stuff I have shot, (and basically hid) finally make it on the walls of galleries. Selling my images as art is my first goal, and secondly would be making money with some fashion & other commercial work done my way. I would shoot skating again if given the right opportunity, like a tour to document or a company in need of branding. What are your favorite cities in the world to skate in? Barcelona and Vancouver. The first one is obvious, as Spain sets the bar high for picturesque skatepark like architecture. But, Vancouver’s North Shore is by far the best place for off-roading and trail skating. What cities would you love to go skate in that you haven’t been to? New York for it’s classic streets, Tokyo for its futuristic look, Rome for its historic buildings, Delhi for its dated and kind of dirty style & Lima to off-road the ancient Inca highway. You are one of the most prolific skaters in putting out online content. I really enjoyed the On One Hundos Under Cover edit you did. How often do you actually skate a 4x100mm setup or 4x110mm setup? How does skating 4×110 compare to skating 3×110? I still own those same 4×100 frames and wheels, but do not find myself using them too much. To me, they are the perfect frame for mixing aggressive and free skating. This is something I do not do here skating alone, but did do a ton of back in Spain, as I found it a pain to take two pairs of skates, or just big wheels and not be able to enjoy the spots with the boys. It is comforting having the regular amount of wheels, and the “groove” being where it is supposed to be, unlike when you ride 3×3’s. Four 100mm’s are a little long, but not too long to have the ability to do all the grinds on just the wheels. The Death of the 4th wheel edit by Mathias von Gostomski of you is easily one of my favorite blade edits! It is visually stunning and really is what made me want to get the Megacruiser Pro skates! It is filmed and edited so well and takes place in such a surreal location. Where was it filmed? How was it working with Mathias? That’s great to hear that I did my job and sold you on the skates! That ad was shot right in Barcelona, at a rarely visited location on Mont Juic. Back when we lived in the Powerhouse, we had that mountain as our backyard, so we ended up finding this graveyard quite early. I used to take people on late night trips there when it was closed. It is such an eerie but lovely place to be hanging out when it’s dead. Years later I was pondering a location to film that skate ad with Mathias von Gostomski, and voila it clicked… 3 wheels, death to the 4th, graveyard, etc… Mathias is the best, literally, he does his thing, and you do yours, never worrying about how the end product is going to look. It is actually the opposite, you skate already knowing that it is going to look better then you could ever imagine. The North Shore edit you did has over 400,000 views! It is really the edit that made people dream of getting off-road skates. How was filming that edit? Was this an intense skate? How rough was it skating those wood berms? Off-roading the North Shore is by far the most popular thing I have ever done on my skates. I got a couple of news and radio segments from it, and cannot even count the amount of times it has been reposted and shared on the Internet. Shooting it was also some of the best times I have had. I spent two days hanging out with two girls and another blader for one of the days. Like I mentioned earlier, Barb knows how to handle a camera, and the other girl, Amber, went to photography school with me. They both documented it as we hiked and I tried out these trails. I had no idea if the berms were possible, I had always dreamt of skating them. I had googled what seemed like the best trails, but in reality, they were a little intense. But while out exploring the woods, we did find the ideal conditions and managed to film some of the best off-roading I have done. Being out in the woods with no pressure, made it super enjoyable, so much so, that I keep dreaming of round two. Tell me about your Mallorca big wheel adventures. Mallorca is paradise, and pretty good for skating. I spent most of my time there either exploring beaches or the mountains surrounding our village. It is my wives homeland, so we will defiantly be going back at some point soon. When we do, I will be sure to skate the mountain trails and street spots that I found, but never got around to doing. My stay last summer was just a tease; just wait for the real Mallorca adventures. In your opinion, who is the best big wheeler in the world? Hands down, that has to be Leon Basin. Look at what he has done, from his literal trickery in his mushroom blading profiles, to his part in the production of the wizard frames. Nobody took big wheels that seriously and so quickly. The rest of the industry sat on the fence like pussies, too scared to get involved in the new scene, thinking they’d be ridiculed for such. Where do you see big wheel going the future? I see it taking over where aggressive left off. I cannot wait to watch the first ever 80mm and up park comp! It will be a much bigger and faster show for the crowd to enjoy. As well, I cannot wait for off-road racing and dirt jumping to take off. Those are also real shows for the public. Cess slide through the water. Did you expect so many aggressive skaters to get into big wheel blading? Actually yes! There is no denying the fun once you have skated a big wheel setup. All it took was a few “cool” kids doing it, and then everyone wanted to try them out. I was quite surprised at the amount of times I heard hate on big wheels. Aggressive skaters need to realize that the big wheel movement has put more lubricating money into our drying up and squeaky skating industry. Big wheels are bringing together different disciplines of inline skating (downhill, slalom, freeskate, speed, aggressive, etc..). This is the first time this is ever happening. With the sport getting some sort of unity, I feel could really change the direction of inline skating in the future. What are you feelings on this? There is some sort of blurring of the lines happening, but I do not think it is going to ever be a full mix. There will still be a difference in mentality amongst different kinds of skaters. Just as I do not imagine long boarders and the true head street pushers to get along, I don’t see many aggressive bladers socializing with slalom skaters. I really hope some new style of skating emerges from this mixture of disciplines… street parkour on big wheels or BMX style dirt jumps on off-road blades would be amazing to see! What do you enjoy the most about skating? The days spent with your best friends, touring around a city with just your skates and cameras. There are no rules or time restrictions to be followed, just your instincts on where the next best spot is to be found. Skating allowed me to explore so many amazing places that regular people would never get to see while visiting the same city. Also, the ability to create something, whether it be videos or photos or tricks or products or whatever, I love being creative because of skating. 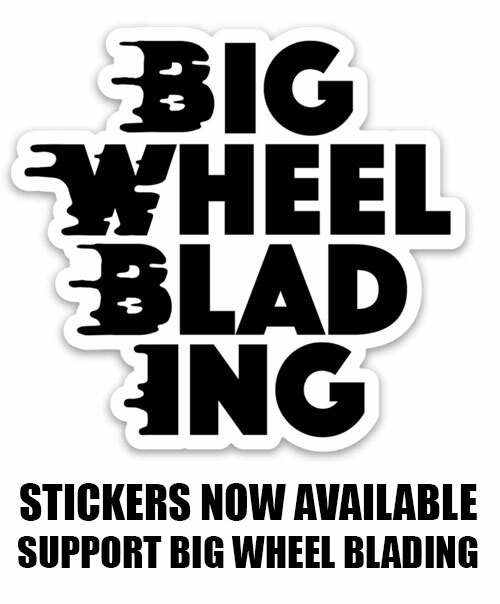 Bigwheelblading.com’s mission is to help all the disciplines of inline skating grow by unifying our sport through. The entire sport of inline skating and only grow when we are all united. We are striving to create quality original content on all the disciplines of skating. This is only possible with YOUR support. If you like what we are doing and want to see more frequent and original content, like this story, then please donate anything you can.